Jesse with Ken Griffey, Jr.
1. When did you leave/arrive? 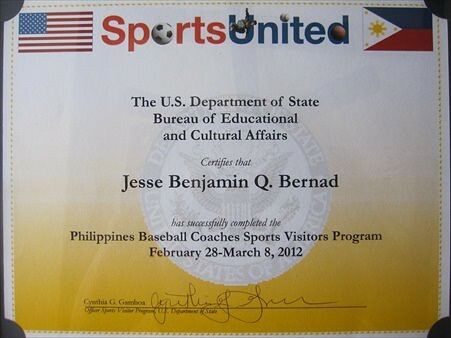 The Philippine Baseball and Softball Coaches delegation left for Scottsdale Arizona on Feb 28 and came back Mar 12, 2012. 2. How many were you from the Phils? 12 of you and you were the only one from Cebu? There were 12 coaches that were chosen among dozens of applicants coming from all over the Philippines. 6 men and 6 ladies. 3 from Mindanao(Davao, Cotabato, Zambo Norte), 3 from Visayas (Cebu, Bacolod, Talisay NegOcc) and 6 from Luzon (Ilocos, Bulacan, Smokey Mountain, Las Pinas, Valenzuela and Batangas). Yes, i was the only 1 from Cebu. 3. What was the objective of your trip? 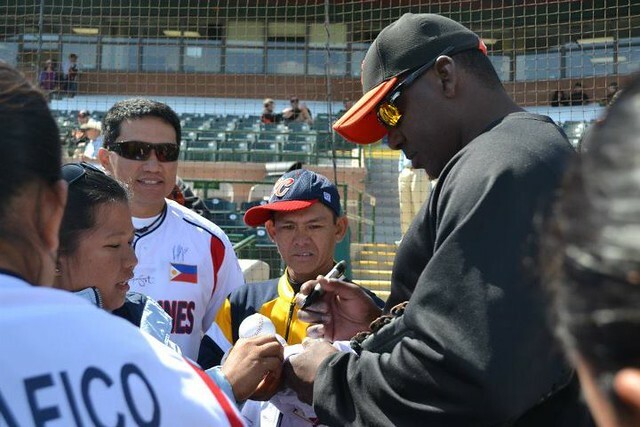 The US Embassy saw the potential of the sport of Baseball and Softball in the Philippines. Hence, they wanted Coaches with existing programs to be appropriately trained in the US to improve the quality of their players. 4. Was this the first time the US government did this? Yes, this was the first time of its kind. The US state department has a program called Sports United and they invite Sports Ambassadors to visit the US and experience/observe how they run the different sports programs. Our group had been the 16th group. There were other groups from other countries before us who represented other sports like basketball, tennis, golf, etc. 5. Details of the trip… Our host gave us a full schedule wherein we were able to observe firsthand how Americans ran their baseball program at different levels of play starting from Little League, High School, College and the Pros. Initially, we were sent to a baseball bootcamp where former Major League Players turned coaches Ken Huckaby and Clay Bellinger thought us the basics of coaching. We then got to visit a couple of Little League Programs one of which was Chandler and worked with their kids applying what we learned in the bootcamp. We also visited some High School programs like Dessert Vista and interacted with their coaches and players and discussed their program and how it works. University of Arizona was the only college program we saw but it was the best – what an amazing sports program and facility they have. State of the art gym, locker rooms, equipment room and fields. Lastly, we got to visit 3 Major League Spring Training facilities – San Diego Padres, Kansas City Royals and San Francisco Giants. They toured us around their facilities and saw firsthand their practice sessions. We got to meet and interact with some MLB coaches and players. 6. Where did you stay? Who did you meet? we stayed at the Radisson Fort Mcdowell Resort in Scottsdale which is just a few miles away from most baseball Spring Training facilities in the Pheonix area. Coach Ken Huckaby and Clay Bellinger were excellent coaches with lots of Major League experience. 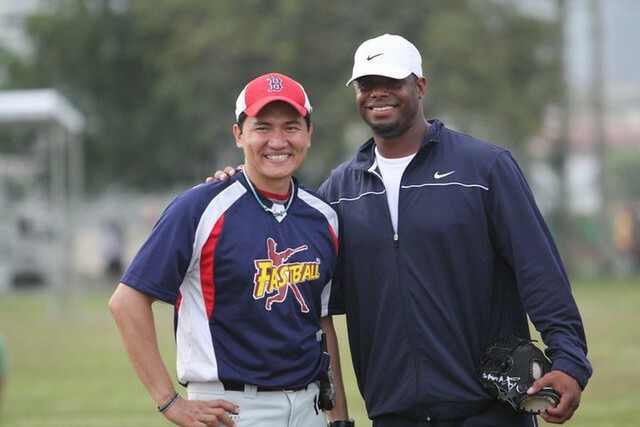 Unfortunately, former MLB player Ken Griffey, Sr. – the father of MLB superstar Ken Griffey Jr (who visited Cebu last year) couldnt make it to our clinic due to his busy schedule. We had a very intimate meeting with the Legendary Softball Coach Mike Candrea of University of Arizona and Team USA, who brought 8 NCAA championships to UA and 2 Olympic Gold Medals for Team USA. He gave us a 30-minute inspirational talk – which is very rare for a guy of his stature – and another 30 minutes of Q&A. We got to meet 3-time All-American softball player Alicia Hollowell as she toured us around UA Softball field and practice area. Coach Dave Lopez of UA Baseball team was also very open in sharing his knowledge of the game. During our MLB visits, we met most of the players and talked to some most notably Fil-American San Diego starting shortstop Jason Bartlett and outfielder Carlos Quention, San Francisco Giants Batting Coach Bam-bam Muelens, etc. 7. What were the most significant moments? The most significant moment was being at the field at the SF Giants Spring Training Stadium while the players were having batting and fielding practices and getting to see all the players and superstars. We then got to see them play against the Colorado Rockies and we were 2 rows behind their dugout. So we were very close to all the players and even heard them talk. Another Fil-American Tim Lincecum was the starting pitcher for the Giants. As a baseball fan getting to experience all this, is the ultimate high. 8. Full Access? we had access to places where other fans were not allowed to go to like stadium clubhouse, locker rooms, dugout, mess hall, gum, etc. Since the US State Department was the one who arrange our visit, there was a PR person who was assigned to us fulltime to take us around, explain their organization and introduce people to us. 9. What lessons did you learn from the trip? oh so much! we all learned the right way how to ran a program. To be competitive, it is not enough to practice once or twice a week. You need to let the players do the drills over and over again for them to make the right split-second decisions during games. Four 2-hour practices a week and 1 game should be the minimum. We were also taught how players and coaches carry themselves during practices and games. We learned how to apply the different types of coaching in the 4 disciplines of the game – fielding, hitting, throwing and base-running. We were taught new drill variations and methods using unique but inexpensive equipment. And lastly, the sequence on how you run practices starting from warming-up up to cooling down. 10. Does softball/baseball have a bright future in Cebu? Phils? Oh yes, baseball and softball has a very bright future in Cebu and the Philippines. It just has to start somewhere. I learned that there is no quick fix to the sport. We need to start from the very bottom which is to teach very young kids (6-8 years old) the proper way to play. These kids will grow up learning the sport and when they reach the age of 11-12, they will be very competitive already. So it will take a few years. I just came from Clark Freeport 2 wks ago and saw how teams from other parts of the country playing excellent baseball and softball already. I was amazed how well they play. Cebu has to start opening up to the sport especially the private schools. Ateneo, La Salle, UST, UP and other private schools in Manila all have good baseball/softball programs and offer scholarships. Most of Cebu’s private schools don’t have a baseball or softball programs. I am still trying hard to convince the different school administrators to adopt baseball and softball as an alternative sport to students. Fastball summer program…. 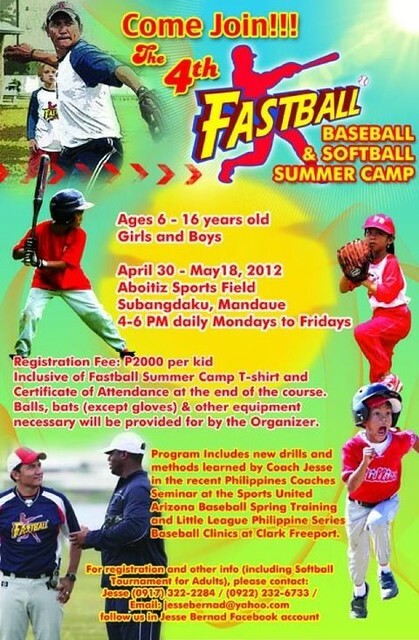 Fastball is starting its 2012-2013 Baseball and Softball program with a Summer Camp for kids ages 5-16 y.o. starting on Monday, April 30 to May 18, 2012 at the Aboitiz Sports Field in Subangdaku. Practices will be from 4-6pm daily, Mondays thru Fridays. For more details, pls contact Coach Jesse Bernad, 0917 3222284, jessebernad@yahoo.com of FB Jesse Bernad. Will you have a summer camp this year (2015)?